Countdown to Good Deeds Day. KEN Jewish Community Your at 20% - Great Job! KEN Jewish Community is the place where Latin Jewish families find friends for life who share their beliefs, values and traditions. Through a wide range of educational, leadership, social, performing arts, and sports programs and activities. 50,000 Aluminum Cans and Plastic Bottles recycle challenge. Students / Parents, Faculty, and staff can work together towards a goal of collecting at least 6 cans or bottles a day per person. 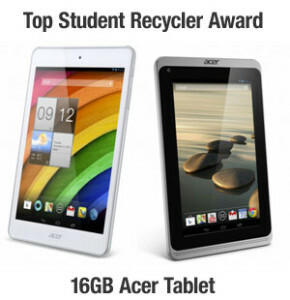 Top 3 students collecting the most bottles or cans individually will receive a FREE 16GB Acer Iconia A1-830 Tablet!